I agree with all of these adjectives and to them I’d add, ‘highly original’. One of the most appealing things about this novel from my point of view is that it is set in the Italy of the 1960s, in the aftermath of the Fascist régime, when the country was still reeling from the effects of its Second World War defeat. That the author presents Italy from the perspective of a policeman who formerly served as a soldier in a defeated army gives it both depth and substance. Partly because of the background to its setting and partly because the main action in the novel takes place fifty years ago, Vichi is able to create a springboard for some serious – but never over-weighty or didactic – reflections on morality. (For example, Inspector Bordelli recalls an occasion during the war when he and some fellow soldiers came upon an isolated detachment of Americans who were shaving, and decided not to kill them because they were thus rendered defenceless.) The murder investigation that is central to the novel – it is the killing of a very unpleasant debt collector, stabbed in the neck by a pair of scissors – also raises some knotty moral issues, which increase in complexity as Bordelli closes in on the killer. But above all, it is the glorious cast of characters that makes this novel special. All are originals; some, like Rosa, the ex-whore who is one of Bordelli’s ill-assorted menagerie of friends, are highly eccentric, yet none lacks credibility. Then there is Bordelli himself, a highly-principled, slightly lonely character who doesn’t exactly live for his job yet often ponders on what he will do without it, now that his retirement looms. His repeated invitation that acquaintances should join him for dinner on Christmas Eve gathers poignancy as none of them quite refuses, but – until very late in the day – none of them gives him a firm acceptance, either. He is very susceptible to the charms of the women and girls that he meets during the course of his work, sometimes dangerously so, but he always manages to wrestle down temptation and allow his professionalism to win the day. His solicitude for his dying colleague Baragli particularly arouses the reader’s sympathy. Three quarters of the way through the book, the narrative temporarily takes on a picaresque style, as several of the characters relate in detail stories that have been of key influence in their lives. Despite the almost Chaucerian vitality and immediacy of these stories, on a first reading they have the annoying effect of stalling the plot, but eventually the relevance of each of them becomes apparent and I’m certain that, if I were to read the book again, I should be less impatient of them and enjoy them to the full for the minor masterpieces that they are. Death in Sardinia is a crime novel, but it is much more than that. It is a perceptive distillation of the human condition that captures many of its foibles as well as the depravity into which it is capable of sinking and the acts of nobility to which it can sometimes rise. This novel apparently comes third in the Inspector Bordelli sequence; I am now determined to seek out some of its companion works and enjoy them, too. I’ve not grabbed this one yet (but I will). I’ve read Death in August twice! I am fascinated with Italian mysteries and regularly check out Italian-mysteries.com for more and more and more – glad you liked this one. As soon as it’s released here in the States, it’s mine! Hi Christina, I have read a few of these books, even seen a T.V., adaptation of one of them (Can’t remember titles – sorry). One of the books came up as Book Choice of the Month, I belong one of the Wakefield Libraries Book Groups. The Group really enjoyed the different style. They seem to have been written with humour in mind. Some of the things the detective got up to on stake outs…. All the same, they are well written and enjoyable. Tonight, I have been googling the author Susan Hill, she is not someone i have come across before, although her web site says she has written 56 books! I have downloaded one to my Kindle to see if I like her style of writing. She does have a very interesting web site. There is one book that is almost her autobiography through the books she has read over the years.Again, I can’t remember the whole title, it is something to do with Howard’s Landing. She does publish her own books – Long Barn Publishing..
Hi Christina, I’ve got my Italian Authors mixed up. The book I have read is The Shape of Water by Andrea Camilleri, it his Inspector Montalbano Series. I shall have to try your Death in Sardinia… Sorry for confusion. Thanks, Marjorie. It’s very easy to mix authors up! I must admit, I like reading novels which are not set in Scandinavia – you can have too much noir! 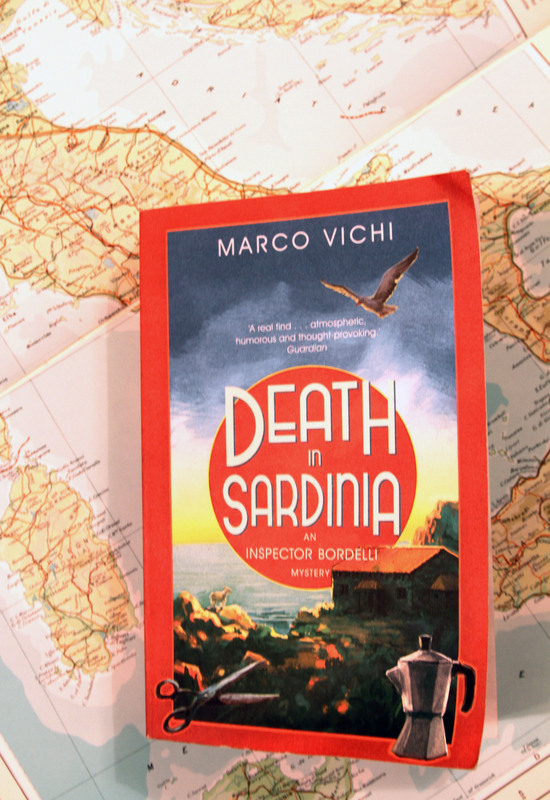 Hope that you find Susan Hill to your taste and do have a try with ‘Death in Sardinia’; I don’t think you’ll regret it. Now you’ve got me very interested, Christina. As a big fan of Donna Leon’s Brunetti as well as having a real fondness for Sardinia, I feel this is definitely one for me. Your description of the characters is a further invitation, so now I have to find it. Thank you for the suggestion!! It’s good to find someone you haven’t read and especially so when his book has a freshness to it. I did enjoy this one very much.